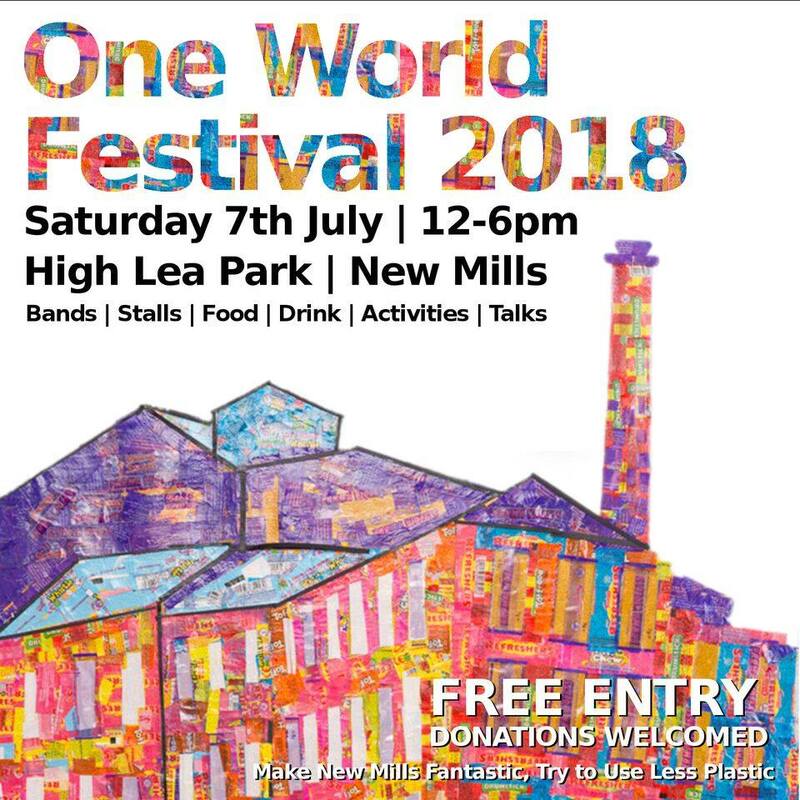 New Mills One World Festival - one of the High Peak's most popular events - is back for 2019! Help needed! Can you spare an hour or two? 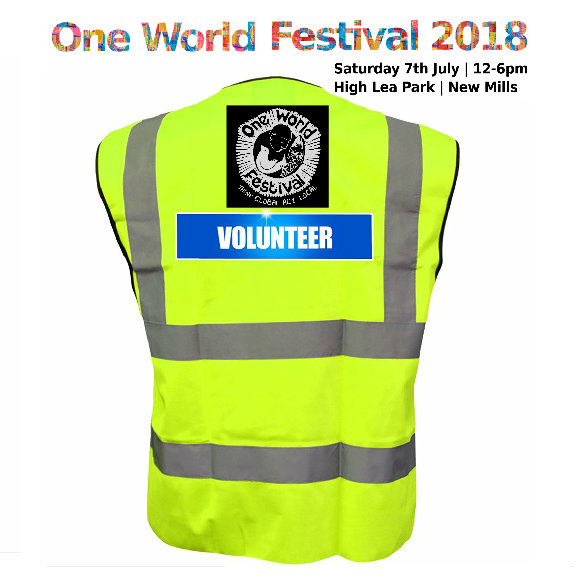 One World Festival cannot take place without the help of volunteers to assist on the day. If you're able to help at the festival, which takes place on Saturday 7th July, we'd love to hear from you. We need people to assist for one hour slots between 9 am and 7 pm. If you can only only manage an hour, that'll be good, but if you can spare 2-3 hours that would be even better. Thank you! 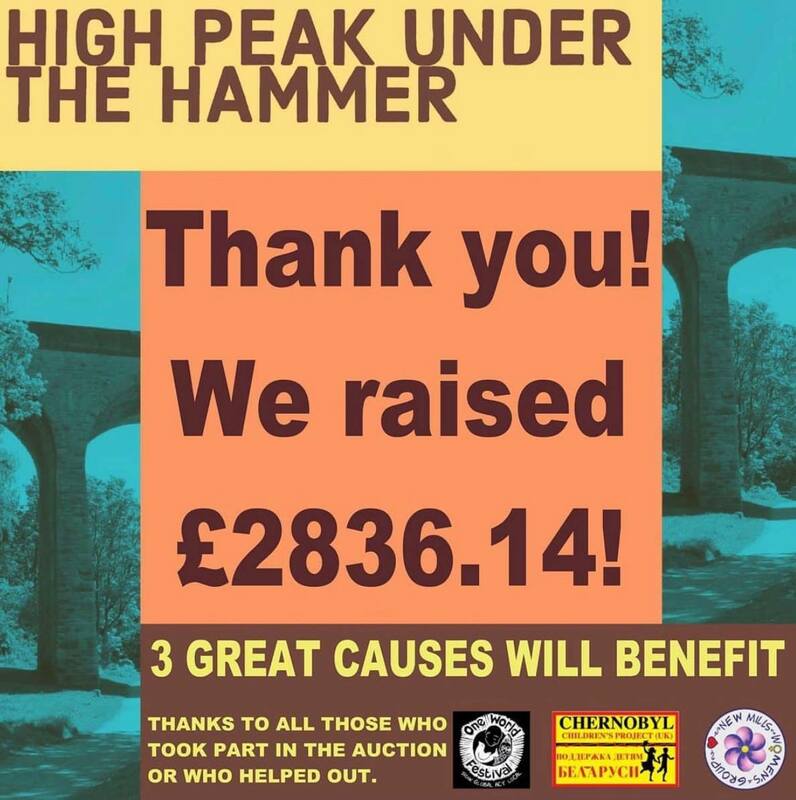 A staggering £2836.14 was raised by High Peak Under the Hammer auction on Saturday night. Thanks to everyone who bid and attended the auction, as well the businesses and individuals who donated lots and those who helped put on the event. The money raised will be split between three great causes; Chernobyl Children's Project Glossopdale and New Mills, New-Mills Womens-Group and the One World Festival. Thanks again. Thank you lovely people! We reached our target! Great news. We reached and exceeded our target in our Crowdfunder appeal, raising a total of £520. With the additional £250 we will get from ‘Santander Changemaker’, we have £770 to help us put on this year’s festival. So a huge thank you to everyone who has donated. And don’t forget, we’ve also got the High Peak Under the Hammer auction taking place on 21st April. In conjunction with Chernobyl Children’s Project (UK) and New Mills Women’s group the One World Festival are holding an exciting auction of promises. We are looking for offers of promises – like half a day’s gardening, cleaning, a trip to the tip, a photo shoot, a car wash – anything that you might be able to do. We’ll auction them and you’ll be raising money for these three charities. Alternatively, you might have something physical to offer – like a piece of art, a stay in a holiday flat, a meal, a shopping voucher – anything would be welcomed. The main auction will be at the Butterfly House at the Torrs on Market Street, New Mills on Saturday 21st April, starting at 7:30pm. - This is for the exclusive online auction that will finish at 10pm on the 21st April. These auctions will start on Friday 6th April. Can you help bring the One World Festival to life this year? The One World Festival is calling on residents to help the festival this year be the best one yet by taking part in a number of fundraising activities. The festival, due to take place on 7th July in New Mills, is a popular, fun packed community event, with celebrating peace, the environment, cultural diversity and world development. •	A crowdfunder has been launched, a first for the festival, offering a number of tiered rewards. Pledgers have the chance to announce bands on stage, appear in the programme or just go away with a warm glow and the knowledge that the event is going ahead. The crowdfunder is supported by a viral video put together by volunteers and stars youngsters from New Mills encouraging people to donate. Pledge before the 12th April to claim a reward. •	High Peak under the Hammer is a local fundraising auction of promises and gifts donated by the High Peak Community. One World Festival, New Mills Women's Group and the Chernobyl Children’s Project UK with all proceeds being split equally between them. The main auction will take place on Saturday 21st April whilst an exclusive online-only auction will launch on the One World Festival website on Friday 6th April. On the night as well as the auction lots there will be music and a raffle as well to keep you entertained. If you can’t be there, you’ll be able to follow the auction on social media. Auction prizes so far include signed memorabilia, a brewday at Torrside, rock climbing, restaurant meals, music lessons and much more besides. Each year up to 5,000 people come down to High Lee Park to watch the bands, relax with their picnics and enjoy the stalls of information from Greenpeace, to the local allotments, Art Theatre and many more. The event is run by volunteers, but costs around £3,500 to run each year, with only around £2,000 being collected on the day. Money raised will be put towards hire of the stage, the sound system, insurance and all the details which make the event a great day out in New Mills! New Mills One World Festival; one of the High Peak's most popular events, is back for 2018! The free open air festival, which celebrates the themes of peace, the environment, cultural diversity, community and world development, will be taking place on Saturday 7th July 2018, from 12 noon until 6 pm at High Lea Park, St Mary’s Road, New Mills. The theme for this year's festival is "Make New Mills fantastic, try to use less plastic" A wide range of bands and performers, from both the High Peak and further afield, including Lazlo Baby, the Love Hearts, High Peak Samba, Holly Marland, the Dirty Jezebels and the Brass Pack, will provide entertainment throughout the afternoon. Alongside the music, there will be various talks, discussions and activities taking place, including some based on this year's theme relating to reducing the use of single use plastic. Use the Programme tab above to see who's on where and when. There will also be various stalls at the event, where those attending can engage with various charities, campaign groups, organisations and local businesses and learn about the work they do and products and services they offer. And those attending will not be going hungry or thirsty, as there will be various food and drink stalls at the event, as well as a licenced bar. As always, the festival is free to attend. It does, however, cost a considerable amount of money to put on, it is not funded by the local Council and the event is organised by a small group of volunteers. We therefore ask people to donate generously to the bucket collection on the day. 2018 festival artwork created by students at St Mary's Primary School. Did you miss the One World Festival in 2017? It’s always a popular, fun packed community event, with a serious edge if you want it. Each year up to 5,000 people come down to High Lee Park to watch the bands, relax with their picnics and enjoy the stalls of information from Greenpeace, to the local allotments, Art Theatre and many more. Oxfam volunteers say "thank you #NewMills you've bought us a farm"! Proceeds from two events this year - the stall The One World Festival and the Visit New Mills Quiz-it Night raised £500. Using Oxfam "Unwrapped" gift cards we've purchased a 'virtual farm'. Our farm is 'virtual' because it does not exist in just one location, but is made up of smaller projects that will benefit may different communities by making a lasting difference to the lives of people living in poverty in developing countries. "Unwrapped" project gift cards purchased for our farm include buying sheep, chickens, goats, bees and a small farmyard complete with its own freshwater well. The 2016 One World Festival poster based on Deborah Pitman's canvas from the '25 Years : 25 Canvases' project. The wildlife in High Lea Park, New Mills, inspired Deborah Pitman's canvas to celebrate the 25th anniversary of the One World Festival. Placing the trees and the birds at the heart of the design the artist calls to people to be mindful of the need to care for the natural environment. Every year for some time now the major fundraiser for the One World Festival has been an auction of promises. The auction is organised in partnership with New Mills Women’s Group and is always a fun and successful night. This year has been no exception. Last Saturday we had a very successful auction and raised a total of £2,128, a brilliant result. A massive thank you to everyone who supported New Mills Under the Hammer by donating lots, bidding online, and coming on the night. Your continued support is much appreciated. The 2016 One World Festival AGM and pre-festival warm-up gig was held on the 19th March at The Torrs in New Mills. Thank you to all who attended and showed your continued support. The 2015 Annual Report and Treasurer’s Report are now available. There has been progress on the next steps for the 25 Canvases project from the One World Festival. Very kindly, Tim Hensel has taken photos of all the canvases. The photos have been set to a slide show with our song “Beautiful Days” composed for this year’s festival by Adam Hutchins. The slideshow can be seen here..
We have arranged to have the canvases displayed in the New Mills Heritage Centre from 4th January for six weeks. We will be rotating the canvases over this period as we will not be able to display them all to once in the space. Why not pop down and have a look? Knit and Stitch with New Mills One World Festival and New Mills and District Volunteer Centre. We have been knitting squares for a large blanket that will be donated to Knit for Peace, www.knitforpeace.org.uk, a charity that distributes knitted goods at home and abroad to keep vulnerable people warm. Please join us at the KNIT and STITCH tent to knit squares and sew up the blanket. Final line up for the 25th New Mills Festival announced! We are pleased to announce the line up for the One World Festival 2015. We have a full day of lively music, including finishing with local favourites, White Van Man. We are also looking forward to the premier of a new song celebrating the 25 years of the One World Festival. 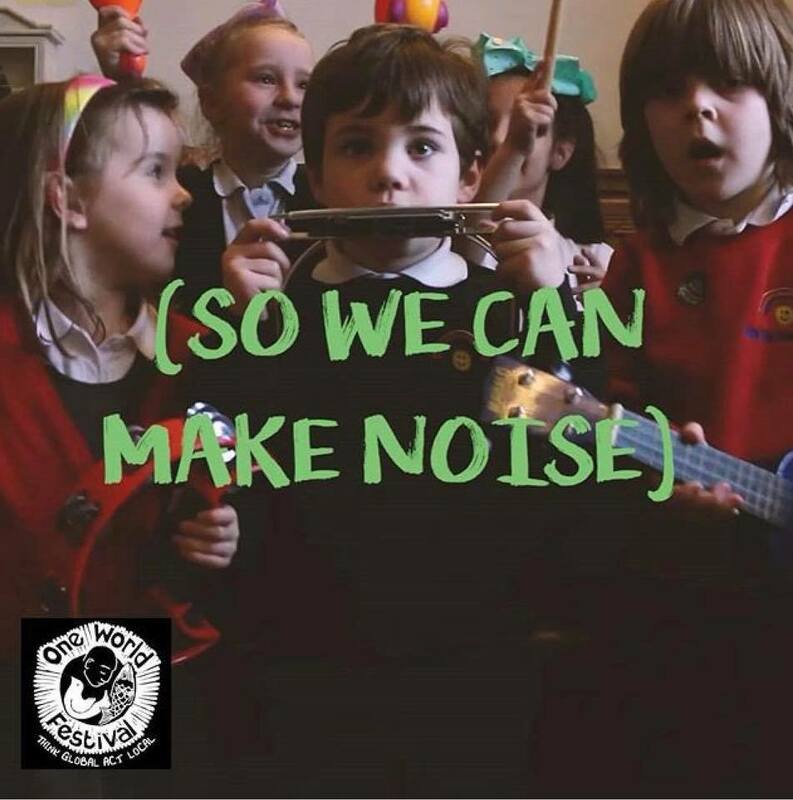 The song has been written and arranged by Adam Hutchins, and will be performed on the day by young people from the ‘Take Part … in the Art’ theatre group. Not to be missed! Most of our volunteers will be working along side someone else, so let me know if there is someone you would like to work with, or why not recruit a friend to help as well? Please pass on this information to anyone interested. Email info@oneworldfestival.org with offers of support. The poster for the 25th One World Festival has now been released. The poster has been designed by Karl Sinfield (http://sindesign.co.uk/) and limited editions prints will be available at the Festival. Keep your eyes peeled for this stunning poster around the town and beyond over the coming weeks. 6 weeks to go! As part of the celebrations of 25 years of the One World Festival, we are looking for 25 individuals, groups or organisations to create 25 canvas panels showcasing what the New Mills One World Festival means to them. The artwork might be inspired by a theme of the festival from past years, memories, or what the festival personally means to you. We will provide canvases approximately A1 size made of stretched cotton over a wooden frame. We are planning a pick up day for canvasses, inspiration and more information at The Torrs on the 16th May. You can adapt the canvas however you like, get creative! The final products will be displayed around the festival grounds on the 4th July. Want to be involved? Let us know. We are happy to announce that funding for the 2015 One World Festival is progressing nicely. Firstly, we are very grateful for continued support from New Mills Town Council. A Community Grant of £450 was awarded last month. This money will go towards our special music and art projects to celebrate the 25th year of the festival. Did you know that New Mills now has a weekly pub quiz with proceeds each week going to a different local group? The One World Festival was the recipient of one of the recent quizzes and was presented with £94 at the end of the night. Each Thursday the quiz is at a different local pub, check visitnewmills.co.uk for details of quizzes coming up, and please support these great nights. Most recently, last Saturday we held our annual community auction, New Mills Under the Hammer. We share the organisation and proceeds of this event with New Mills Women’s Group (http://www.nmwg.org.uk/), and this year produced another brilliant auction. We raised nearly £1,800 in total, all from donations made by local people, shops and services. Thank you to everyone who supported the event, the auction is the major fundraiser for both our groups and this funding will keep us going for another year. A montage of photos has been put together celebrating the 25 years of the One World Festival in New Mills. Photo credits to Sheila Brown, Rick Seccombe, Sean Whewell and Patty Doran. The photos are set to 'One World' by Write Van Man, the iconic New Mills band. Please view and share. The One World Festival AGM is being held on Saturday 14th March, 6pm at The Torrs, all welcome. The theme of the AGM is one of celebration. 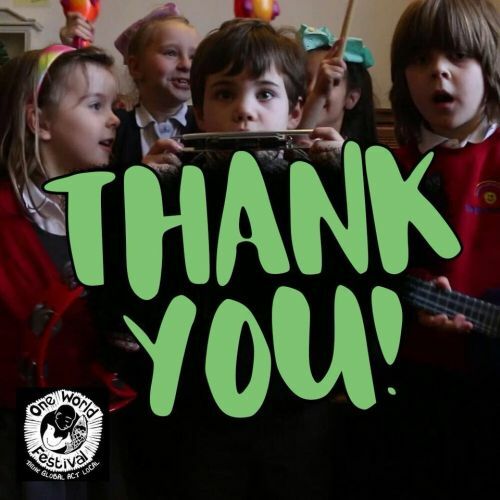 We would especially like to acknowledge the support the festival has received from the New Mills community, and the commitment of many individuals which has ensured that the festival has continued over the years. The AGM will cover reports on the previous year’s activities and a financial update. This will be followed by a presentation of images, music and quotes celebrating the 25 years of the One World Festival, 1990 - 2015. All welcome, but please let us know if you are going to attend for catering purposes. To carry on the celebrations, Aidan Jolly and Friends will be putting on some live music. This is a free event, but donations to the One World Festival will be gratefully received. Doors from 7.30pm, The Torrs will be providing a licensed bar. So come on down and join in the fun! Remember good times from the past 25 years, and get excited about this year’s festival.